More and more, research tells us that our children's healthy development depends on safe and positive experiences during the first few years of life. If you are a parent who works during these early years, choosing good child care is one of the most important decisions you will ever make for your child. To help you make the right choice for your child, researchers have identified 13 research-based guidelines to think about when choosing a child care program. You might want to visit several different child care programs, either centers or family child care homes, before you decide which one is best for your family. Call each child care program and schedule an appointment for your visit. Once you are there, stay for at least an hour to watch activities, check the surroundings, and ask questions. This form provides a place for you to note which guidelines are met; the checklist below provides a place where you can make notes on up to 3 different child care programs. Research shows that if a program follows guidelines, it is more likely to be a safe and healthy place for your child. Your state or county may have other guidelines to help ensure health and safety in child care programs. Considering these guidelines can help you find a place where you feel comfortable leaving your child. Are children supervised at all times, even when they are sleeping? How do the caregivers discipline children? Hint: Discipline should be positive, clear, consistent and fair. Do all caregivers and children wash their hands often, especially before eating and after using the bathroom and changing diapers? Do caregivers clean and sanitize the surface after finishing the changing process? Hint: Hands should be scrubbed with soap and water for at least 10 seconds and then rinsed and dried. The water faucet should be turned off with a paper towel. Does the director of a child care center have a bachelor's degree in a child-related field? Has the director worked in child care for at least 2 years? Does the director understand what children need to grow and learn? Does the lead teacher in a child care center have a bachelor's degree in a child-related field? Has the teacher worked in child care for at least 1 year? Does the teacher give children lessons and toys that are right for their ages? How many children are being cared for in the child care center? How many caregivers are there? Hint: Your child will get more attention if each caregiver has fewer children to take care of. The younger the children are, the more caregivers there should be. For example, one caregiver should only take care of three babies. Is your child up-to-date on all of the required immunizations? Does the child care program have records proving that the other children in care are up-to-date on all their required immunizations? Are toxic substances like cleaning supplies and pest killers kept away from children? Has the building been checked for dangerous substances like radon, lead, and asbestos? Is poison control information posted? Does the child care program have an emergency plan if a child is injured, sick, or lost? Does the child care program have first aid kits? Does the child care program have a plan in case of a disaster like a fire, tornado, flood, blizzard, or earthquake? Does the child care program do practice drills once every month? Can caregivers be seen by others at all times, so a child is never alone with one caregiver? Have all caregivers gone through a background check? Have all caregivers been trained how to prevent child abuse, how to recognize signs of child abuse, and how to report suspected child abuse? Does the child care program keep medication out of reach from children? Are the caregivers trained and the medications labeled to make sure the right child gets the right amount of the right medication at the right time? Have caregivers been trained how to keep children healthy and safe from injury and illness? Do they know how to do first aid and rescue breathing? Have they been trained to understand and meet the needs of children of different ages? Is the playground inspected for safety often? Is the playground surrounded by a fence? If there is a sandbox, is it clean? Is the playground equipment safe, with no sharp edges, and kept in good shape? Are the soil and playground surfaces checked often for dangerous substances and hazards? Is the equipment the right size and type for the age of the children who use it? If you would like more information on the research of Dr. Richard Fiene that supports these health and safety guidelines, please check out these websites: http://nrc.uchsc.edu and http://aspe.hhs.gov. A printed copy of the research paper, 13 Indicators of Quality Child Care: Research Update, is available from the Office of the Assistant Secretary for Planning and Evaluation, 200 Independence Avenue S.W., Room 450G, Hubert Humphrey Building, Washington, DC 20201 and is available on the web at http://aspe.hhs.gov/hsp/ccquality-ind02. 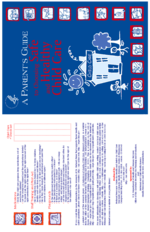 This Parents Guide can be downloaded from the internet at: http://aspe.hhs.gov/hsp/ccquality-ind02/guide.pdf or http://aspe.hhs.gov/hsp/ccquality-ind02/guide.htm. For more information on choosing a safe and healthy child care setting, contact your local child care resource and referral agency by checking CHILD Care Aware, a national consumer education parent hotline and web delivery system, website: http://www.childcareaware.org or by calling 1-800-424-2246, or the National Child Care Information Center (NCCIC) website: http://nccic.org or calling NCCIC at 1-800-616-2242. Internet access is available at your public library. To obtain a printed copy of this pamphlet, print the PDF Version (2 pages) on a color printer.